Mile High Video Slot Review - Casino Answers! 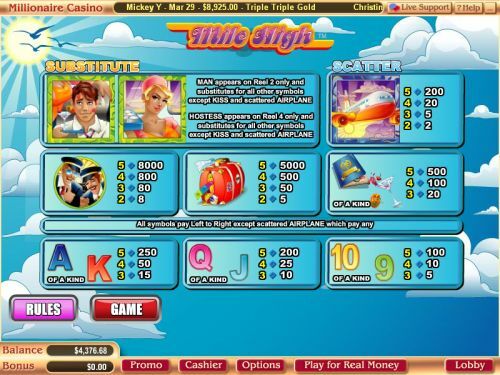 Mile High is a 5-reel, 25-line video slot developed by Vegas Technology, featuring two wild substitute symbols, expanding wilds, scatter wins, multipliers, a free spins feature and a bonus game. You can play the Mile High video slot at Bovada. The Mile High casino game is a penny slot. Bets on the Mile High slot machine are $0.01, $0.02, $0.03, $0.04, $0.05, $0.10, $0.15, $0.20, $0.25, $0.50, $0.75, $1, $2, $3, $4 and $5. You can select from 1 up to 25 paylines per spin. The maximum total bet that you can make on the Mile High video slot is $125, which is a good betting range for online slots players. To play the Mile High slot game, select your bet and hit the “Spin” button. You can also use the “Bet Max” button to play all 25 lines on a spin. The top-paying symbol on the Mile High video slot is the Pilots symbol. When 5 Pilots symbols appear on a selected payline, you will win the 8000 coin top jackpot. The second highest paying symbol is the Luggage. By hitting 5 Luggage symbols, you can win the second highest payout of 5000 coins. There are two wild symbols on the Mile High online slot. The first one is the Man symbol. It only appears on the second reel. The other one is the Hostess, which only appears on the fourth reel. Both wild symbols will substitute for all symbols except for the Kiss and Airplane symbols. The Mile High video slot has a Kiss Kiss Kiss pick’em bonus feature. When 3 Kiss symbols appear, you can choose a Kiss symbol to win up to 50X your bet. You can also win all three of the bonus prizes. The bonus prize is added to payline and scatter wins. This feature cannot be triggered during the free spins feature. Mile High’s scatter symbol is the Airplane. When two or more Scattered Airplane symbols appear, you can win up to 200X your total bet. When three or more Scattered Airplane symbols appear on the reels, you will trigger the Select A Play feature. You can select 5, 8 or 12 free spins. The first option is 12 free spins where the Man and Hostess symbols become 2X wild multipliers. When both symbols appear, your win will be multiplied by 4X. The second option is 8 free spins where the Man and Hostess are 3X wild multipliers. When both appear, they will be a 9X wild multiplier. The third and last option is 5 free spins with 4X wild multipliers. When both appear, they will become a 16X multiplier. During the free spins feature, the wild symbols will become expanding wilds to cover all three positions on the reels. The free spins feature can be re-triggered. Free spins are played at the lines and bet of the triggering spin. Free spins feature wins are added to payline and scatter wins. You can use this free spins feature to win big when you play Mile High at Bovada! Hit “Autoplay” to open up the Mile High autoplay mode where you can select the number of spins (5, 10, 25, 50, 100, 250 or 500) and number of seconds between spins (1, 1.50 and 2). Stop settings include stop once all spins are complete, stop when jackpot is won, stop if a win exceeds or equals ($50, $100, $150, $200 or $250), stop on any win and stop if credits increase/decrease by ($50, $100, $150, $200 or $250). You can cancel autoplay on the Mile High online slot at any time. 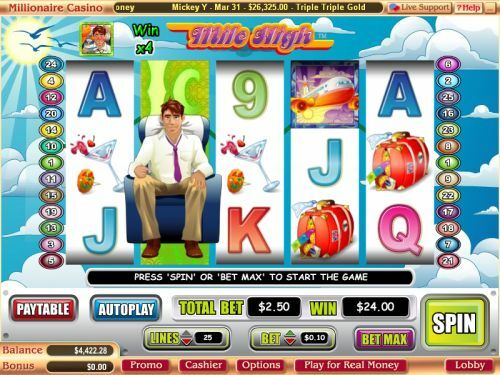 The Mile High slot machine from Vegas Tech offers some mile high payouts, a choice of three unique free spins features and bonus prize wins. In addition to that, the presentation is good and the theme is original. You can play the Mile High online slot when you sign up and make a deposit today at Bovada! Can USA-based players play the Mile High slot game for real money? Yes, American players are welcome to play the Mile High video slot for real money. You can sign up and make your deposit at USA-friendly Vegas Tech casinos like Bovada. For additional USA-friendly casinos where you can play this exciting video slot, please read our list of Vegas Tech online casinos. Where can I play the Mile High flash game in my web browser? If you are looking to play a Mile High free flash game from the convenience of Internet Explorer, Firefox, Opera, Chrome, Safari or whatever browser you prefer, head on over to Bovada and use the “Instant Play” option. You will be able to play the Mile High flash game for free or for real money. If you have any difficulties with the flash slot game, download the newest version of Adobe Flash Player.